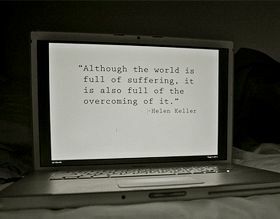 Overcoming is to conquer or defeat the hurdles and oppositions that stand in our way. The life is full of boredom and dullness if there are no hurdles and happiness and satisfaction come only in overcoming these hurdles and emerging victorious. The greater the obstacle, the more glory in overcoming it. It is difficult to be successful in all our endeavors and have a smooth cake walk. Hurdles are sure to oppose every now and then and overcoming such hurdles are a necessary trait to be developed by us. For instance, Helen Keller had all kinds of physical deformities but she had the strength of mind and determination in overcoming all the obstacles. “Anyone who has never made a mistake has never tried anything new” said Albert Einstein. These quotes on overcoming stand as a source of moral strength and encouragement and you can share them with all those who are down in spirits.